The Busks to release debut album "Spare Change"
Left to right, Justin Holt, Dylan Miller, Jacob Miller and Wesley Sadler make up "The Busks." 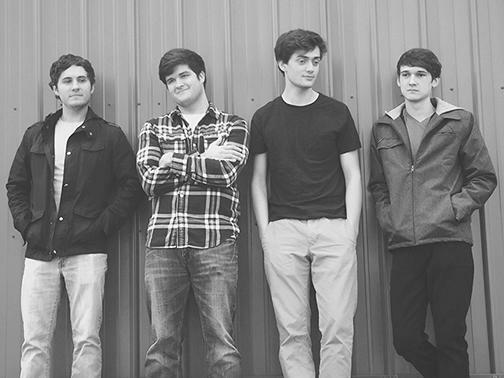 The Busks are a four-piece band from Woodbury. The band plays a fusion of rock, pop, and folk music. The group maintains a balance of craft and immediacy that reflects their affinity for the sound of class acts such as The Guess Who, as well as The Black Keys, while echoing the influence of pop icons like The Beatles. They've combined their many influences in a distinctive way while adding tranquil vocals alongside meaty instrumentals. The band's debut album, "Spare Change," features 22 songs including the two singles "Ugly Girlfriend" and "I'll Be Your Man" (both of which are available on iTunes). The album was recorded in Woodbury and mastered in Murfreesboro. The album is set to release on December 21st and can currently be pre-ordered on iTunes. Physical copies will be available online at thebusksmusic.com and at Little Shop of Records in Murfreesboro, Tennessee. The band also has t-shirts available on their online store. It all started with two friends with a common love of music. Jacob Miller and Dylan Miller decided to embark on a journey of musical experimentation. The band went through a few changes but wasn't complete without the addition of Dylan's brother-in-law, Justin Holt, and Wesley Sadler, a longtime friend of the band. After these crucial additions, the band took off and hasn't looked back since. The band continues to learn, grow, and expand their musical palette. The quartet has played from Columbia, South Carolina to Nashville, Tennessee and everywhere in-between. The Chico & B-Man Show recently featured The Busks as guests. The group already has a few shows lined up early in the New Year and plan to eventually go on a nationwide tour supporting their album.